kt literary » Blog Archive » APOCALYPSE is here! 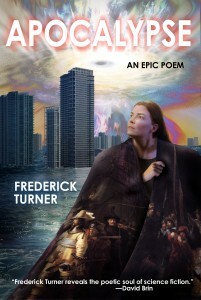 Please help us congratulate Dr. Frederick Turner whose epic science fiction poem, APOCALYPSE, releases from Baen Books today in ebook! APOCALYPSE is the story of a misfit group of scientists who collude against the government to save the world from climate annihilation. Written entirely in iambic pentameter, I originally pitched this book as The Day After Tomorrow done Beowulf-style. APOCALYPSE will be available in October in paperback and museum-quality hard cover – check back here for on sale details! Congratulations Fred! Happy reading everyone – this book took my breath away when I first read it as a slush pile query – it’s beautiful, classic, intense, thought-provoking and awe-inspiring. Enjoy! ← SOLD!!! German rights to Spencer’s debut science fiction!